I’ve often said that while the Mormon church claims to be the only church on the face of the earth that has the authority to speak for God, no one within it seems to speak with any authority. I received a phone call from my friend Russ East who drew my attention to a book titled A Prophet’s Voice: Messages from Thomas S. Monson. This book was published in 2012 by Deseret Book, a company owned by The Church of Jesus Christ of Latter-day Saints. Of course, Thomas S. Monson is the current prophet, seer, and revelator of the LDS Church. When his predecessor, Gordon B. Hinckley died, Monson was set apart as the church’s president on February 3, 2008. Monson has spent much of his life as an employee of the LDS Church. His biography in the 2012 LDS Church Almanac says “for the 22 years prior to being set apart as 16th president of the Church on February 3, 2008, President Monson served as counselor to three presidents: second counselor to President Ezra Taft Benson, and President Howard W. Hunter and, for 13 years, first counselor to President Gordon B. Hinckley.” Considering all the years that Monson has served in leadership positions, you would think that he should be familiar with the doctrines and history of the organization he currently leads. But apparently the church-owned Deseret Book does not want you to assume that. On the copyright page of A Prophet’s Voice is a standard disclaimer that reads, “The views expressed herein are the responsibility of the author and do not necessarily represent the position of the Church or Deseret Book.” You can read the disclaimer for yourself here. The views expressed “do not necessarily represent the position of the Church”? I can expect such a disclaimer on something written by a Mormon missionary or, for that matter a BYU professor, but Thomas Monson? It might be argued that some of the material in the book was said when Monson was a mere apostle; in the course of my 40 years of talking with Mormons, I have heard some say that only the living prophets can be trusted with absolute certainty. But wait a minute, wasn’t Paul a mere apostle when he wrote Romans, Ephesians, or Galatians? If the LDS Church is, as it claims, a restoration of New Testament Christianity, why wouldn’t an LDS apostle’s words carry the same weight as a New Testament apostle? 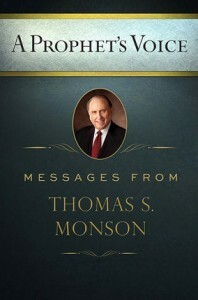 Many of the talks included in Monson’s book were given in general conference. Regarding such messages, Dieter F. Uchtdorf, Monson’s Second Counselor, said, “Listen to general conference with an ear willing to hear the voice of God through his latter-day prophets” (“Why do we need prophets?” Ensign, March 2012, p.5). If that was the case, there certainly seems to be no need for such a disclaimer for this section of the book. Mormonism’s founder, Joseph Smith stated, “When did I ever teach anything wrong from this stand? When was I ever confounded? I want to triumph in Israel before I depart hence and am no more seen. I never told you I was perfect; but there is no error in the revelations which I have taught” (Teachings of the Prophet Joseph Smith, p.368). Four years before his death, Brigham Young declared, “If there is an elder here, or any member of the Church of Jesus Christ of Latter-day Saints, who can bring up the first idea, the first sentence that I have delivered to the people as counsel that is wrong, I really wish they would do it; but they cannot do it, for the simple reason that I have never given counsel that is wrong; this is the reason” (August 31, 1873, Journal of Discourses 16:161). I find it curious that no modern Mormon prophet makes such claims for himself. Instead, there always seems to be this odor of plausible deniability. It would have been helpful if the editors at Deseret Book supplied the portions of Monson’s comments that do not represent the position of the LDS church. But then, how could they unless the editors possess an authority higher than Monson’s? You see, in Mormonism there is no higher mortal authority than the church president (at least officially). No member in the LDS Church has the authority to correct the living prophet. Joseph Smith claimed, “I will inform you that it is contrary to the economy of God for any member of the Church, or any one, to receive instruction for those in authority, higher than themselves” (Teachings of the Prophet Joseph Smith, p.21). So why the disclaimer? If God really desires a mortal prophet to guide the people, why undermine his authority with such a statement? If his words are to be taken with caution, Mormons should not be upset when we do. Hear Eric Johnson and Bill McKeever discuss this topic on Viewpoint on Mormonism (2-part broadcast, aired September 22 and 23, 2014). This article is reprinted from the September-October 2014 issue of Mormonism Researched. This entry was posted in Authority and Doctrine, Mormon Leaders and tagged Church of Jesus Christ of Latter-day Saints, Gordon B. Hinckley, Joseph Smith, LDS Church, Mormon Church, Mormonism, Mormons, Prophets, Thomas Monson. Bookmark the permalink. 9 Responses to President Monson’s Views Don’t Represent the Mormon Church? It’s interesting to see how time has changed the true church. First, we see that it was corrupted, and lost to a great apostasy. 1. Jesus said, “I will build My church; and and the gates of hell shall not prevail against it.” (Matt. 16:18b, KJV). 3. Jesus said, “I am the way, and the truth, and the life; no one comes to the Father but through Me.” (John 14:6, NASB) – There is no mention of any church or denomination through which salvation can come. And finally, it ends up with this, the great disclaimer of all time. Should the prophet say yes and no if he alone speaks for God on the earth? later Joseph Smith appeared on the scene and claimed God told him to to restore it . clever sales techniques and an appeal to emotions can sell almost anything . the latter days — Tim 4: 3, 4 . Great word “disclaimer” isn’t it? Why don’t the Mormon people get it? What I mean is that they are all full of themselves that they have this supposed prophet who hears directly from the Mormon god. Then they add all of these clauses and subclauses to the contract that basically leaves the hot stuff pretty cold. I know I can’t leave this alone but think about the implications of this disclaimer prophet on someone like Ralph who has told us he’d kill or steal if told to do so directly by the prophet. Really? A smart prophet would do such a thing when no one was around so he’d have plausible denial-ability. The prophet could pull out the disclaimer to avoid any culpability. Think of the level of brain washing that allows a faithful LDS sect Mormon to hold to such a level of cognitive dissonance. The prophet is the big brag for these folks and yet the organization stamps his utterances with a disclaimer. The Mormon people do indeed deserve better. So the LDS folks live in a mental parallel universe. On the one hand they venerate their prophet who they contend has a direct communications line open to the Mormon god of this planetary system. But then they disavow all sorts of things their prophets have taught, said and predicted. This is part of the “counts-doesn’t count” scenario of the LDS system. I’m guessing that any prophecy that didn’t pan out goes into the “doesn’t count” bin or is stamped with a “past due date” sticker. Most of what Brigham Young taught or did gets the disclaimer. I suppose the whole Journal of Discourses is “doesn’t count”, “opinion” and “disclaimer” stamped. So what good are these prophets? We have been told that what they bring forth in GC only counts if the people sustain it by acclamation/vote. Think about it. That’s a fairly small percentage of the total prophetic utterances by these guys. The rest, then, is just blue sky speculation and rah rah motivational speeches. As a practicing Catholic, I was taught that the pope was infallible under certain circumstances and conditions. LDS sect Mormonism has no such condition. It’s basically every prophet for himself. That’s why the practice of “continuous revelation” has made such a mess out of LDS doctrine. Everything is subject to change at any given moment. That even includes the doctrines of the nature of God and of salvation. While totally confusing to someone who doesn’t think Mormon, it’s all great fun for the LDS believer. Although I respect your faith in Christ, I wonder if you can explain when Catholic theology parallels LDS theology and contradicts Christ. Extra ecclesiam nulla salus which means there is no salvation outside of the church. After the 2nd Vatican Council, Pope John Paul II danced around the topic and finally towed the line: salvation outside the Catholic Church is not possible. Jesus said, “I am the way, and the truth, and the life; no one comes to the Father but through Me.” (John 14:6, NASB) – There is no mention of any church or denomination through which salvation can come. Churches are to be a community in which one can practice Christ’s teachings (Heb. 10:25, NASB). They are not meant to be means of salvation. Only Christ is. So, if you’re a practising Catholic, it means you practise what the Catholic belief is, that is no salvation outside the Church. Or you believe that only Christ can save. You cannot believe both. RikkiJ , I think you misconstrued what Falcon said , concerning being a Catholic . Thanks for defending me but I guess after five years of posting here, I have to come out of the closet and say to RikkiJ and everyone else that yes, if you’re not Catholic you’re going to hell! I know it seems harsh, but sometimes you just have to be blunt and call a spade a spade. In the beginning, Christ gave the keys to thee Church to St. Peter. He was the first pope. There is a lineage of popes, therefore, that go back to Peter. Therefore the Catholic Church is the One True Church. There was a great apostasy called the Reformation led by Martin Luther where those who followed him warred against thee Church. So to be saved someone must be baptized Catholic, go to confession and communion at least once a year during Easter, attend Church every Sunday, and of course keep all of the Ten Commandments as given to Moses and the Six Commandments of the Catholic Church. I don’t want to go into everything someone has to believe when Catholic but the bodily assumption of Mary into heaven is one of them. That KERPLUNK you hear is Sharon’s head hitting her desk! I will bring you chocolate Sharon when we get together at Caribou Coffee in the Southdale Mall. Hm? I guess that was sarcasm? You’ll have to update me with your sense of humor.